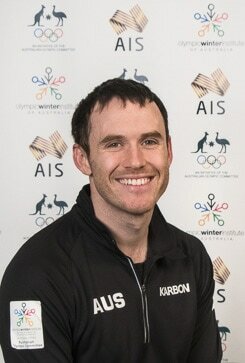 A former gymnast, David Morris was recruited to Aerial Skiing by World Champion Kirstie Marshall and began his international competitive career in 2007. As the sole male member of the Australian Flying Kangaroos, David worked hard to match the skills and results of the strong female team, making his first World Cup appearance in 2009. Morris made his Olympic debut at the 2010 Olympic Winter Games in Vancouver, Canada, placing thirteenth but his break-through World Cup season came in 2012/13 and highlighted his strong technical advance with his first podium appearance (bronze) in Lake Placid, USA. David went on to win a World Cup in Bukovel, Ukraine, making him the first an Australian male in Aerial Skiing to do so. Heading into the 2014 Olympic Winter Games in Sochi, Russia, Morris was determined to avenge any disappointment from not making the top 12 and finals. His Olympic Silver medal achieved his dream in the best possible way with a remarkable performance under pressure. After taking a break from competition during the 2014/15 international season, Morris made a successful return in 2015/16, winning World Cup medals in the first two events of the season. Morris, who had been injury free most of his career, struggled early in the 2016/17 season World Cup season with niggling injuries. With the World Cup season over and results not up to his expectations, Morris went into the World Championships in Spain as determined as when he approached his Sochi silver medal. Coming away with the World Championship bronze in the last event of the 2016/17 season vindicated his push to continue achieving the results he expects. Known for his general good humour and supportive team attitude, David Morris is also a keen and artistically talented photographer who chronicles events by capturing the atmosphere and feeling of his surroundings. Up to and including the 2016/17 season David Morris has competed in 39 World Cups, making the finals 22 times in a tough men’s field and appeared on the podium five times. Proudest moment: Winning an Olympic and World Championship medal with my parents there watching. Best sporting memory from 2016/17 season: 3rd at the World Championships in Sierra Nevada, Spain. After disappointing results/crashes in the four competitions leading into Worlds, I pulled it back together at the right moment to win my first ever World Championship medal. I began my sport in 2003 when Kirstie Marshall (former Olympian in Aerial Skiing) saw me tumbling at my gymnastics club and asked if I was interested in trying aerial skiing. I’d seen it on TV, thought it looked cool, gave it a go and have never looked back. When I am not training or competing I am: Taking photos, video editing, watching movies and always being active. I enjoy my sport because there is always something harder to do, and there will be a point where each athlete reaches their own personal limit. One day I will go to attempt something and be too scared to do it and I want to know where that limit is. Education: Bachelor of Applied Sciences in Physical Education. I’m a PE / Maths teacher. Favourite international competition: Sierra Nevada, Spain. Beautiful location and despite the overly warm weather, the best jump site I’ve been on. Favourite Music: Anything that motivates me to get up and do something. Favourite other sport to watch or play: Any, as long as it’s a good game/competition. I am inspired by performances rather than who is doing them. My Hero is: I try to be my own hero. I’ve been inspired by so many over the years, and I want to be a collection of all that I thought was the best of those people. Sponsors: Wayne Ritchie’s Ringwood, Dalbello Boots, Marker Bindings, Tisa Skis, BounceInc, Aerosphere Goggles. Childhood Ambition: To compete for Australia in a major event and walk in an opening ceremony in my Aussie uniform.